London, 21 January 2016: OMS LLP announced today that it is to establish an alternative league table for the football clubs in the English Premier League. Each club will be rated based on its leadership, management quality and capability for creating sustainable value; not only with respect to its players but from all human capital connected with the club. 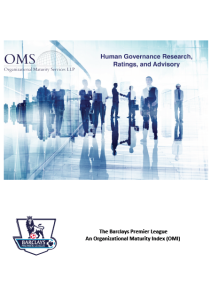 Following on from its groundbreaking and highly successful Global OMI, covering FTSE100 and other global companies, OMS’s ‘Premier League’ will take a wide range of factors into consideration to rate each club and link these ratings to league position and revenue generation but also operational effectiveness, social impact, fan satisfaction, brand and the reputation of the sport. The Premier League OMI will be released together with an in-depth report on 18 March 2016. Previous PostSeeking True Alpha through Maturity AnalysisNext PostThe ‘beautiful game’ – maturing gracefully?